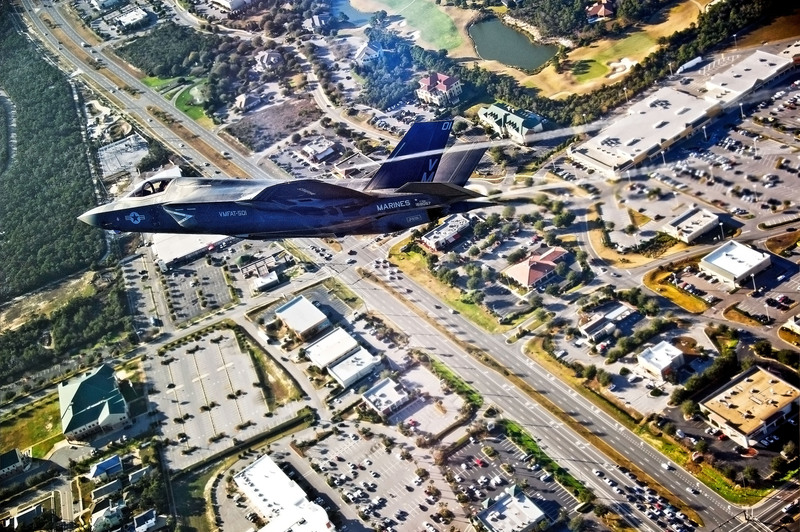 The first American production F-35B Lightning II joint strike fighter flies over Destin, Florida, on its way to its new home. Marines at a Florida base have received the first two F-35B Lightning II variants of the Department of Defense's fifth generation fighter. On January 11, the planes flew to the 33rd Fighter Wing, Marine Fighter Attack Training Squadron 501 at Eglin Air Force Base — a moment that marked significant progress in a struggling program that has repeatedly﻿ faced threats of cancelation. The Marine squadron at Eglin is scheduled to receive five more F-35Bs this year and continue joint strike fighter maintenance with their new variant — no date has been given yet for the fighter jet's arrival in Beaufort where they will be stationed and used for training. As a little bonus, we've uploaded a gorgeous﻿ 2,500-pixel wide version of the image up top that you can use as your desktop background — download it here. If you haven't been following, know that the F-35B is set to be a big win for the Marine Corps Air Station Beaufort with nearly $700 million in capital improvements planed and under way, but the plane has been struggling to clear testing.